Grogmaster Blog: Getting Smaller with iPhone #2: Lose It! In my last post I pitched The Hacker’s Diet and shared a bit about my initial, positive results on a calorie counting diet. In this one I’ll talk about Lose It!, the highly-recommended iPhone app that I used for budgeting and actually counting those calories. Lose It! 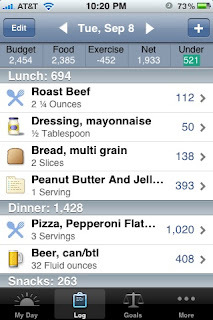 is a free (as in “go try it right now because you don’t have to pay any money for it”) app for iPhone and iPod Touch that tallies up your food and exercise and tracks it against your day’s budget. Your food calories are added (and your exercise calories subtracted) from your daily budget, which Lose It! calculates using your current and goal weights, and an estimation of your metabolism from height, age, and gender. Lose It! is clever enough to adjust the budget down as your weight changes, since your burn rate will be lower when there’s less of you. I was initially afraid that the amount of estimation required in calorie counting would turn me off. While Cait will figure out the calorie counts of meals she cooks, and the chain restaurants we visit have published numbers, local restaurants tend not to provide nutrition information, nor does Google, where I eat most of my lunches. As a precise-minded person, I was worried that if I couldn’t tally things exactly “right” I’d give up in frustration. This, so far at least, has turned out to not be that big of a deal. With calorie counting, consistency matters more than strict correctness, since you can adjust your daily intake budget to compensate for your demonstrated weight loss rate. Nevertheless I will admit that the pure novelty of playing with Lose It! and calorie counting (“shiny!”) has been wearing thin, so I’m less excited than I used to be about scouring the Web at 11:50AM to find estimations for the day’s lunch. Once again, the promise of continuing my past success has to keep me interested. For anyone who has an iPhone or iPod Touch and is considering calorie counting, I’d seriously recommend Lose It!. It’s a high-quality, very useful app at a literally unbeatable price. Daniel Jalkut has called out the “ ubiquitous calorie accountability” that comes from counting with an iPhone app as a crucial element. I’d certainly agree. In The Hacker’s Diet parlance, this is as close to an “eat watch” as I’m likely to get. I rely on Lose It! to be the sensible angel on one shoulder to balance out the pizza-loving, booze-swilling devil on the other. All it seems to take is the little, subtle hint that I should forego the last slice / pint / scone / whatever and I can resist with only minimal grumbling. And again, I cannot yet argue with the results. One tool you may remember from The Hacker’s Diet is a moving-average graph of your own weight. Unfortunately, Lose It!’s graph is only of your raw weight data, so I’ve picked up another app to handle this aspect, which I’ll talk about next time.